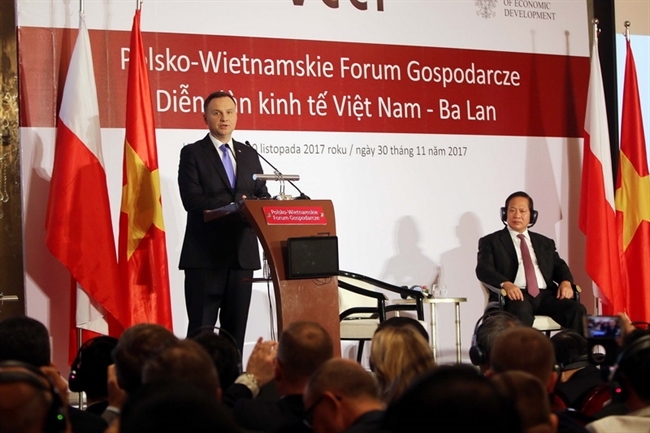 On November 30, 2017, Polish President Andrzej Duda left Ho Chi Minh City, successfully wrapping up the state-level visit to Vietnam (from November 27-30, 2017) at the invitation of State President Tran Dai Quang. 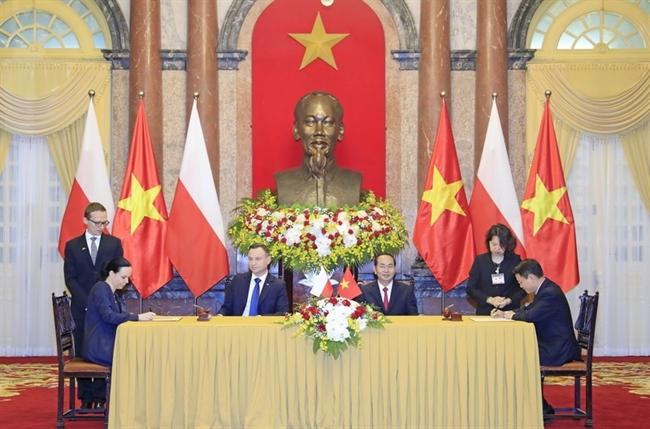 During the visit, President Andrzej Duda held talks with State President Tran Dai Quang and witnessed the signing ceremony of cooperation documents between the two nations; had meetings with Party General Secretary Nguyen Phu Trong and Prime Minister Nguyen Xuan Phuc; attended the Vietnam – Poland Business Forum and the inaugurating ceremony of the representative office of the Polish Investment and Trade Agency and met with the Chairman of the Ho Chi Minh City People’s Committee. 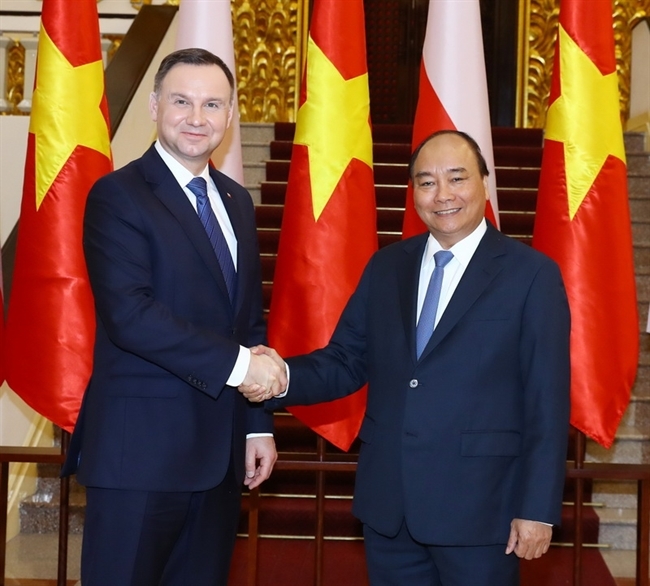 On the occasion of the visit, the two sides issued the Vietnam –Poland joint statement. 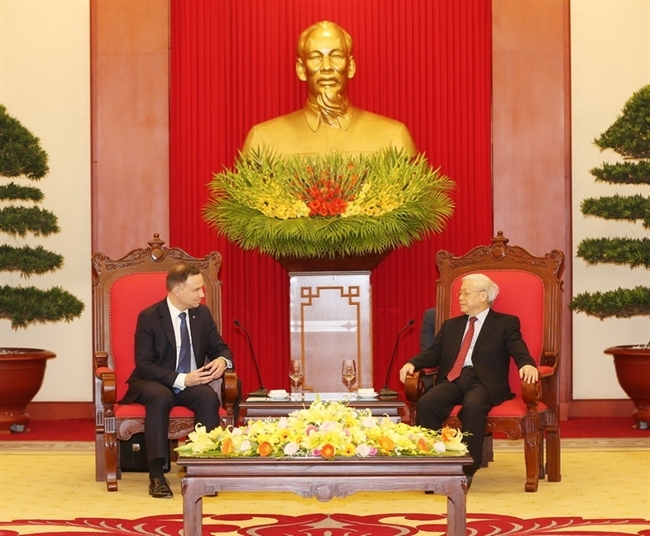 At the meetings, the two sides expressed their satisfaction with active developments of the traditional relations and multifaceted cooperation during the 67 years of Vietnam and Poland’s relationship. 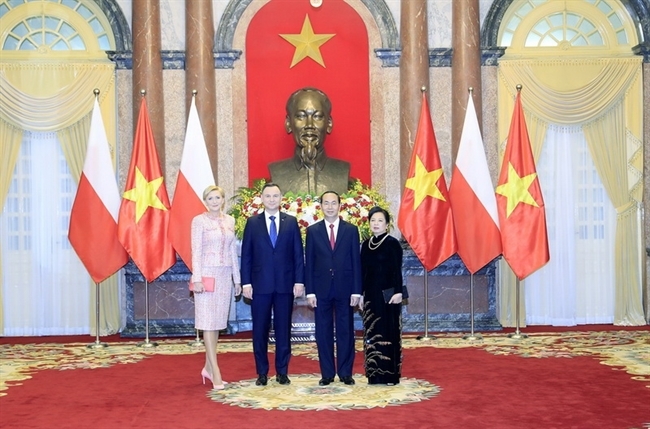 State President Tran Dai Quang, his wife and Polish President Andrzej Duda and his wife pose for a photo. 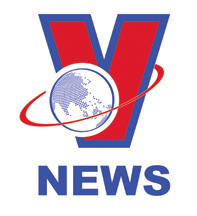 on pharmaceuticals investment between Dat Vi Phu Vietnam company and the Adamed Group of Poland. 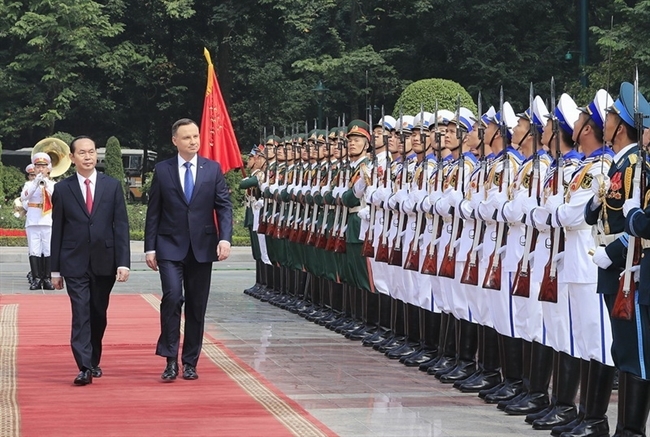 to welcome President Andrzej Duda and his wife during the state-level visit to Vietnam. The leaders applauded facilitating high level political dialogues and the exchange of all-level visits via the State, Government, National Assembly, business and local channels to promote further bilateral cooperation in shared concerns of the two countries. 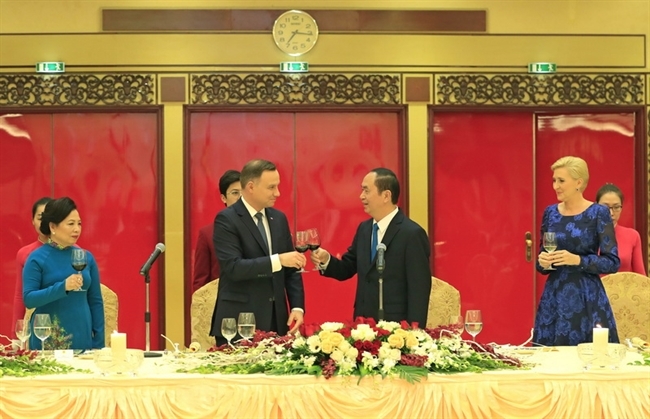 On November 28, 2017, State President Tran Dai Quang and his Polish counterpart Andrzej Duda witnessed the signing ceremony of a memorandum of understanding (MoU) between Vietnam News Agency (VNA) and the Polish Press Agency (PAP). 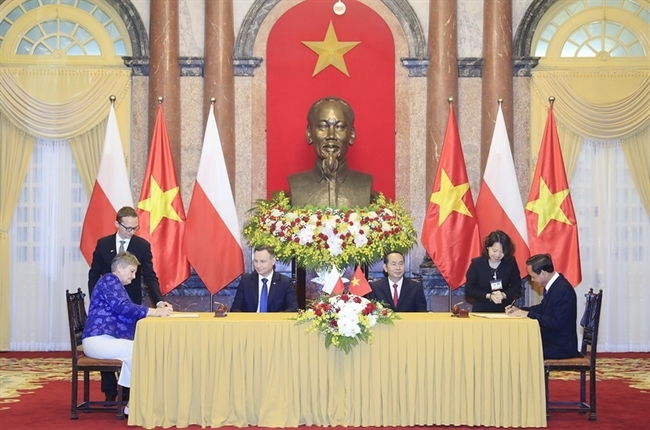 The MoU was signed by VNA General Director Nguyen Duc Loi and Polish Ambassador to Vietnam Barbara Szymanowska. 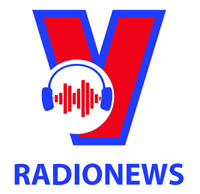 Under the MoU, the two agencies will exchange text news, photos and video clips in English for the purpose of publishing them on their news channels. 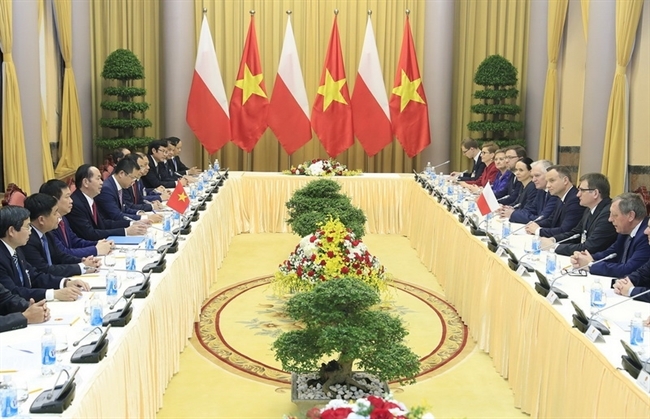 The two sides appreciated the achievements in bilateral trade and investment cooperation as well as efforts made by the two countries in negotiating and signing a financial cooperation framework agreement worth 250 million euros, creating a legal basis for the implementation of cooperation projects in Vietnam using official development assistance (ODA) provided by the Polish Government. They agreed to negotiate and sign an agreement on a qualifications reference framework to promote learning mobility. 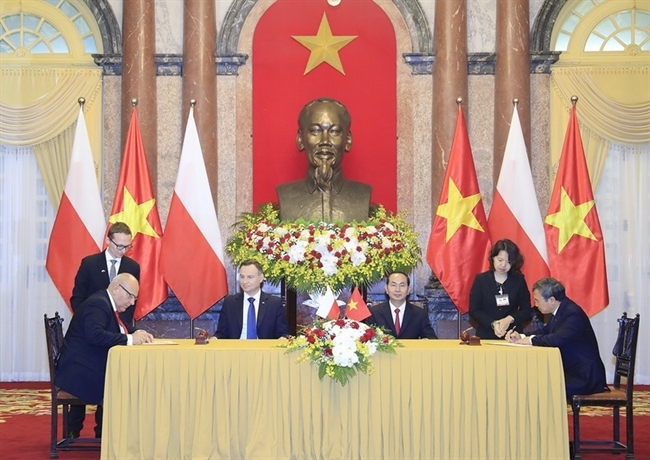 The leaders also signed a letter of intent to set up a Polish course between Hanoi University and the Polish Ministry of Science and Higher Education. The two sides shared experiences and reached a consensus on strengthening cooperation in the fields of agriculture and environment; underlined the importance of the bilateral collaboration in science-technology and information and communications in the context when the world is entering the industrial revolution 4.0. They also agreed to boost the bilateral cooperation in culture and tourism and share experiences in preserving relics and developing heritages’ value. They also agreed to boost national defense-security ties, especially the defense industry and military training and share experiences participating in UN peacekeeping missions as well as overcoming the consequences of unexploded ordnances; co-ordinate and support mutually regional and international issues of shared concern; and further cooperate in organizations and multilateral forums./. has a meeting with President Andrzej Duda.